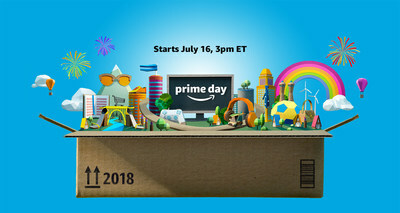 SEATTLE, July 3, 2018 /CNW/ - (NASDAQ:AMZN) – Amazon's highly-anticipated annual shopping event, Prime Day (www.amazon.ca/primeday) will start on July 16 at 12 p.m. PT/3 p.m. ET and will run through July 17. Bigger than ever, Prime Day (and a half) will extend from 30 hours in 2017 to 36 hours, with more than one million deals exclusively for Prime members around the world. Members in Canada, the U.S., U.K., Spain, Mexico, Japan, India, Italy, Germany, France, China, Belgium, Austria and new this year Australia, Singapore, Netherlands and Luxembourg, can shop deals across TVs, smart home, kitchen, grocery, toys, fashion, furniture, and back-to-school supplies. Not a member yet? Eligible customers can start a 30-day free trial at www.amazon.ca/prime to participate in Prime Day. Amazon Brands – Find the lowest prices of the year on products from Amazon private label collections including up to 25% off AmazonBasics and Pinzon. Amazon Devices – This year, Prime Day will feature double the deals on Amazon devices—and the biggest deals yet on home security, smart home and Alexa-enabled products. Whole Foods – On Prime Day, members will save 30% when they spend $35 or more on Whole Foods 365 Everyday Value products on Amazon.ca. To celebrate the first Prime Day for Whole Foods Market stores, members in Canada will receive $10 off all in-store purchases over $50 from Wednesday, July 11 to Tuesday, July 17. Prime Video, DVDs and Blu-Ray – Save up to 50% on popular movies and TV shows on DVD and Blu-Ray. Members will also get a $10 Amazon.ca credit for their first stream on Prime Video between Monday, July 9 and Prime Day. Kindle Unlimited – Eligible Prime members can get three months of unlimited reading for $0.99 with a Kindle Unlimited membership. Watch A Deal – This is the easiest way to preview, track and shop all limited time lightning deals during Prime Day, learn more here. The Amazon App – Download the Amazon App to shop Prime Day deals wherever you go. Also, customers who download the Amazon App for the first time starting today through Prime Day will receive a $5 credit towards their Amazon.ca account. Explore Deals By Popular Interests – Find deals organized by the most-shopped-for interests. From style and fashion to electronics, cooking, travel and more – discover the deals that you'll love even faster. Prime members from around the world can shop hundreds of thousands of deals this Prime Day from small and medium-sized businesses selling on Amazon Launchpad, Amazon Handmade, Amazon Exclusives and more. On Prime Day 2017, customers ordered more than 40 million items from small and medium-sized businesses worldwide, and once again this year, these businesses are adding to the unsurpassed selection available every day on Amazon. Prime was designed to make your life better every single day. Over 100 million paid members around the world enjoy the many benefits of Prime, including shopping and entertainment. In Canada, that includes unlimited access to award-winning movies and TV episodes with Prime Video, access to over one million songs on Prime Music, unlimited photo storage with Prime Photos, Twitch Prime, early access to select Lightning Deals, and more. Prime was built on the foundation of unlimited fast, free shipping and members receive Prime FREE Same-Day Delivery in Toronto and Vancouver, Prime FREE One-Day Delivery in over six cities, and unlimited Free Two-Day Shipping on millions of items. Start a free trial of Amazon Prime at www.amazon.ca/prime.